The Saatchi gallery doesn’t scream feminism. It doesn’t even whisper it. Sure, the Saatchi helped launch legendary women artists like Tracey Emin, Rachel Whiteread, Cecily Brown and Cindy Sherman on their paths to fame (half a gold star for that, guys). But for the last thirty years, it’s been about as pale, male and stale as other leading London galleries. When the Guerrilla Girls first erupted on to the New York art scene with their “Do women have to be naked to get into the Met. Museum?” posters referring to the lack of women artists at The Metropolitan Museum of Art in New York, the numbers were troubling. Their masked manifesto stated, “less than 5% of the artists in the modern art section are women, but 85% of the nudes are female”. Two decades later, we’ve had consciousness-raising, campaigning, and calling-out. We’ve had the Max Mara art prize for women, and Siri Hustvedt’s blistering novel The Blazing World. The great pay-off for all that work? At the Guerilla Girls’ last count, 4% of the artists featured in the Met are women, and 76% of the nudes. Some progress. Beyond the Met, the outlook is only a little better. A 2013 Fawcett Society study found that 31% of the artists represented in contemporary London galleries were women. A National Museum of Women in the Arts survey found that 28% of museum solo exhibitions featured women in the 2000s, and noted that only 27 women are named in the influential H. W. Jansons’ History of Art – up from none in the 1980s. Women may constitute 51% of visual artists in the world, but they’re falling through the cracks – failing to pick up shows, exhibitions, creative and critical notice. The highest price paid at auction for a work by a living male artist is $58.4m for a Jeff Koons sculpture. The female equivalent? $7.1m, or less than one-eighth of that, for a Yayoi Kusama painting. A champagne life it may be for the richest artists, but women don’t seem to be invited to the table. An all-female exhibition, then, in a top London gallery? Yes, please. As a concept, it’s electrifying. Champagne Life brings together fourteen artists from around the world. Spanning Saudia Arabia to the Isle of Man, Iran to Australia, working in media as varied as taxidermy, clay sculpture and oil-on-canvas, these works speak to a dizzying diversity of experience. Stephanie Quayle’s clay and chicken-wire sculptures occupy a register between raw power and tenderness. ‘Lion Man’ is a powerful figure, body bent in submission, head and mane blazing with energy. ‘Two Cows’ is an affectionate depiction of – well, what do you think? One cow lays its head tenderly on the other, their gazes soft and heavy with feeling. The two sculptures seem connected, in part through their rich clay colours and a sense of energy within stillness. But sharing a room with Seung Ah Paik’s gorgeous flesh portraits – fingers, folds of fat, feet, brilliantly rendered in skin-tone pinks and browns – does nothing to enhance these works. They’re not gratingly different. It’s worse than that; they just feel indifferent to one another. In the next room, Sigrid Holmwood’s neon-bright depictions of traditional Swedish lifestyles offer strange and poignant portraits of peasant living. They might be by Bruegel as easily as Brouwer, but for the luminous egg tempera brights in which they are painted. By positioning the early modern peasant lifestyle on a continuum leading up to the present day, Holmwood’s works integrate past with present. But the coherence of Holmwood’s works, the way they suggest a dialogue with each another, is once again at odds with the rest of this eclectic exhibition. The artists included in Champagne Life are superb. Their works are, individually, ripe for delectation. 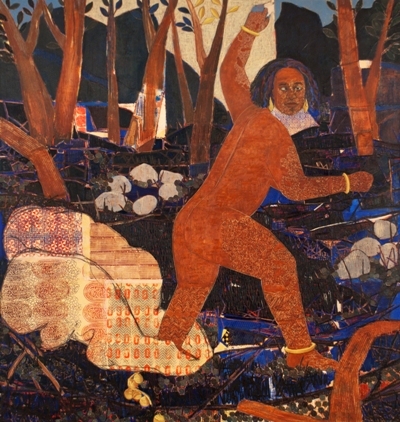 Mequitta Ahuja’s canvases demand a visit in their own right. They are absorbing, complex, densely-layered palimpsests of myth and legend. Indigenous textile arts, printing blocks, letterpress type and stretched animal skin meld together in fantastical bricolage. Gauguin-esque female nudes stride across saturated, over-worked panels. They feel like Klimt undergoing an intersectional feminist awakening. One could keep heaping on the praise. 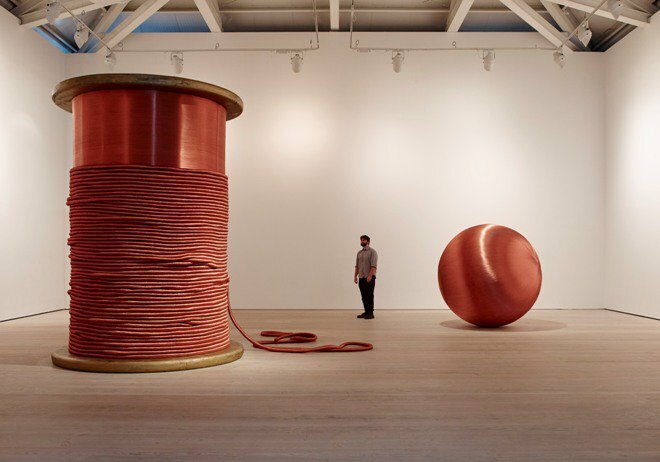 Alice Anderson’s huge copper-mummified bobbin (‘Bound’) and ball (‘181 Kilometers’) are hard to walk away from. Maha Mullah’s charred pots (‘Food for Thought – Al – Muallaqat’) absorbing and enchanting. There’s Julia Dault’s taut bundles of folded plexiglass, alive with their own fragility and destructive power, threatening to ping free at any moment. In fact, it’s hard to name a single work that isn’t deeply beautiful, with the exception of Sohelia Sokhanvaris’ ‘Moje Sabz’. Apparently it’s all about the 2009 Iranian protests, but the whole taxidermied horse thing feels a bit old to me. Champagne Life showcases talent and experimentation in abundance. It’s fizzing with energy, edge and odd ideas which continued to percolate through my brain long after I left. But if it’s unfashionable to offer some kind of coherent vision within an exhibition, then Champagne Life is unbearably on trend. There’s no thread of meaning or concept linking these works. Not a hint of unity. It feels as though Champagne Life is supposed to be held together out of some throwback notion of sisterhood, as though all women’s experience is reducible to the same concerns, even across the widest sweep of geography and history. It’s a well-intentioned gesture, but Champagne Life does little to disrupt the gender norms of a male-dominated art world. We are left with fourteen islands of work, lassoed together in an awkward convoy. They’re glorious, finely-executed and thought-provoking, but as to why they are sharing a gallery space? Because their creators happen to be women. And that doesn’t feel a lot like progress. Photograph 1: Alice Anderson. Image (c) Steve White, 2015. On the left: ‘Bound’, 2011. Bobbin made of wood and copper thread. 345 x 248 x 248 cm. On the right: ‘181 Kilometers’, 2015. Sculpture made after performances, copper thread. 200 cm (diameter). Description: both pieces are in a large white room, with a man standing between them looking up at ‘Bound’. Photograph 2: Stephanie Quayle. Image (c) Stephen White, 2015. ‘Two Cows’, 2013. Air-hardening clay, chicken wire, steel. 230 x 340 x 170 cm. 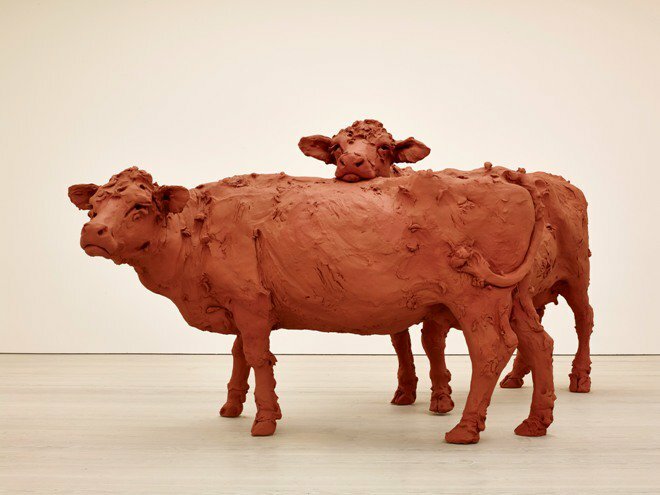 Description: a sculpture of two cows made out of clay. One cow has its head leaning on the back of the other cow. Photograph 3: Mequitta Ahuja. (c) Mequitta Ahuja, 2012. ‘Rhyme Sequence: Wiggle Waggle’, 2012. Oil, paper and acrylic on canvas. 213 x 203 cm. Description: a naked woman, painted in blues, blacks and browns, dances in some woods. 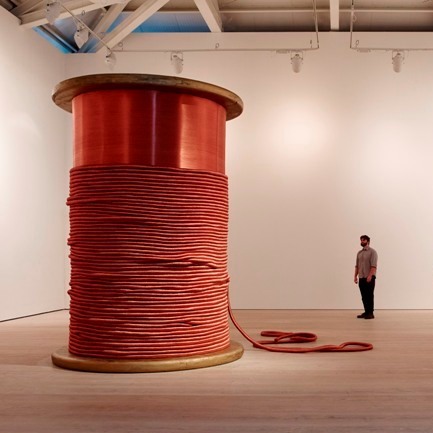 Champagne Life can be seen at the Saatchi Gallery until 9 March 2016. Entry is free. Sorry to be a bone-picker but I thought Georgia O Keefe’s $44m sale overtook Yayoi Kusama’s a few years ago? A bit of art-world progress at least!